Our juvenile courts have several innovative tools available to assist children and youth through the Child in Need of Services (CHINS) and delinquency processes. Courts have the new dual status youth screening and assessment tool that allows courts to better identify crossover youth and to coordinate services for youth, regardless of whether they come into juvenile court as a CHINS or a delinquency case. Many delinquency courts are now using Juvenile Detention Alternatives Initiative (JDAI) to ensure that low-risk youth are placed in community based alternative programs rather than in secure detention. Courts also have Court Appointed Special Advocates (CASA) and Guardian ad litem (GAL) programs to advocate for the best interests of children involved in one or both of these juvenile court systems. However, juvenile courts should not view these tools as silos, to be used alone and not in conjunction with the other tools that are available to support children and families. Instead, we need to view these tools as a three-legged stool, each leg strong on its own, but all three legs needed to create the perfect balance for the best juvenile case decision making. Synergizing these child focused tools will provide better information to all parties and to the court and will ultimately drive better decision making and better outcomes for children. 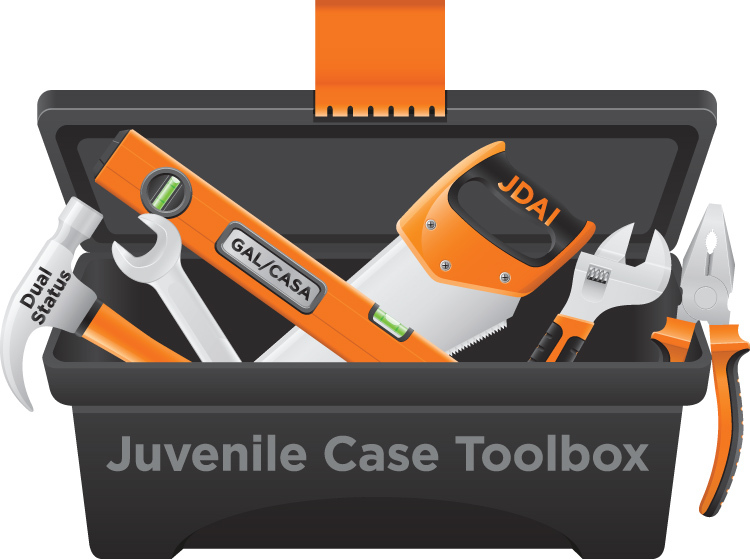 The newest of these tools for juvenile courts is the Juvenile Case Assessment and Triage (J-CAT) pilot project that GAL/CASA pilot programs will use to build capacity and better utilize resources. The Indiana Office of Court Services, through its State Office of GAL/CASA, is working with several counties to implement the innovative pilots, which, like JDAI and dual status assessments, will help to bridge the gap between CASA programs, DCS, probation, and the juvenile courts for a more holistic approach to juvenile cases. The pilots will utilize the Triage Case Assessment Tool (T-CAT) to determine the presence of various risk factors in a CHINS case based on factors such as the age of the child, whether it is a dual status case, whether the parents are incarcerated, whether it is a repeat maltreatment case, and others. Each risk factor has been examined and supported by academic research with evidence demonstrating its validity. The GAL/CASA will complete the evidence-based assessment and obtain a score, which will place the child in a low, medium, or high risk category. The category that the child falls into will then determine the level of intervention, time, and focus that the cases in each level will receive. The pilot incorporates components of both JDAI and dual status. It utilizes a risk assessment to determine levels of risk and levels of intervention much like JDAI and considers the child’s involvement in the delinquency system as a risk factor as well. The pilot also parallels JDAI and dual status cases by bringing together the parties at various stages in a more collaborative, cross-system approach to the case. If a child scores low on the T-CAT, the GAL/CASA program may have less contact with the placement, parents, providers, and others involved in the case, or they may have a staff member cover the court hearing with an abbreviated court report. If the child scores high, the GAL/CASA program will likely appoint a traditional volunteer who will serve the child in the usual manner. The goal of the Juvenile Cases Assessment Tool (J-CAT) is to reduce the number of children waiting for a CASA volunteer by better prioritizing limited resources, including the time and focus of CASA program staff and volunteers. With the significant increase in the number of CHINS filings over the last several years, the waiting list of children in need of a GAL/CASA volunteer has risen to over 6,000 children across the state. The pilot will track the extent to which the waiting list for advocates is reduced as well as its impact on permanency and timeliness outcomes for children in each category. The project was developed after input from several counties, including Tippecanoe, Henry and Hendricks, who for several months have been using some of these concepts to build capacity. Indiana is the first state to utilize this capacity building tool for GAL/CASA programs and it was also the first state to implement dual status legislation to encourage courts and parties to better coordinate cases involving crossover youth. Our vision is that Indiana’s juvenile courts will use all of these cutting-edge tools to create a collaborative, holistic juvenile court system for all children regardless of the door they come through. For more information about establishing a GAL/CASA program, please contact Leslie Dunn at leslie.dunn@courts.in.gov For more information about JDAI, please contact Nancy Wever at nancy.wever@courts.in.gov. For more information about dual status assessments, please contact Matt Hagenbush at matthew.hagenbush@courts.in.gov.